I’m surprised we’ve not seen more stamp-based products. Perhaps there’s good reason (like copyright) blocking the way? 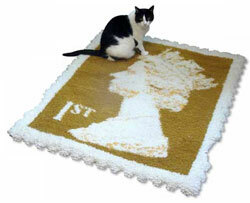 But that doesn’t seem to have bothered Mixko, which has created this rather eye-catching First Class Stamp rug. The rug is made of 100% British wool with a canvas backing. The cat isn’t included, it’s there to show the scale and size, which is 100cm x 120cm. And the price? Well, there isn’t one. Mixko has made this rug as a prototype and is currently looking for a manufacturer to put it into production. Sounds like a good business idea to me.